Successfully Added 10 Port PoE Switch - Supports 8 Devices, 150m Transmitting Range, 100Mbps, Short-Circuit Protection, Energy Efficient to your Shopping Cart. 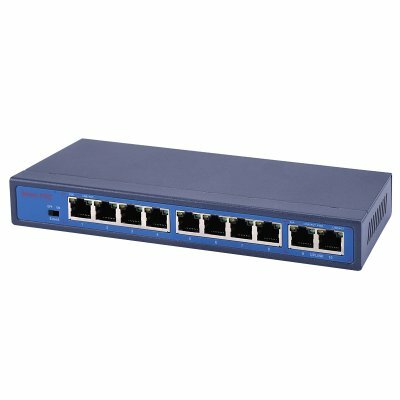 This 10 port PoE switch allows you to easily expand your network connections. Coming with 8 PoE ports, it can provide a connection to up to 8 electronic devices. This makes the PoE switch great to be used with NVR cameras and other long distance multi-media devices. The electronic gadget can transmit power and Internet signals up to a range of 150 meters. Thanks to this, you’ll be able to provide power and network to remotely located devices. With this 10 port PoE switch, you’ll never have to worry about a power supply again. This cool gadget transmits up to 100Mbps. With these speeds, it allows you to enjoy a lag-free experience. Supporting up to 18.4W per port, it can work with the latest electronics out there. Simply connect the PoE box to your WiFi box, and you’ll be able to plug in up to 8 more PoE cables. This will magnificently expand your network capabilities. This 8 port PoE Switch is a great tool for small offices and warehouses alike. With its energy efficient design, this PoE can be used in a cost efficient manner. It also is extremely durable and safe. As it comes with short-circuit protection, you’ll never have to worry about the wellbeing of your electronics. Whenever they are plugged in, they’ll be able to enjoy a stable and powerful PoE supply. It is compliant with IEEE802.3af/at standards. Thanks to this, it is capable of providing a steady internet connection to NVR cameras, external displays, and more. This PoE switch comes with a 12 months warranty, brought to you by the leader in electronic devices as well as wholesale electronic gadgets..
Arabic: - بو التبديل - Chinese Simplified: - 爱伦 · 坡开关 - Czech: - Přepínač PoE - Danish: - PoE Switch - Dutch: - PoE-Switch - French: - Commutateur PoE - German: - PoE-Switch - Hebrew: - מתג PoE - Hindi: - PoE स्विच - Italian: - Switch PoE - Japanese: - PoE スイッチ - Korean: - PoE 스위치 - Malay: - Tukar 2002AND - Norwegian Bokmål: - PoE-svitsj - Romanian: - PoE Switch - Russian: - Коммутатор PoE - Spanish: - Switch PoE - Thai: - สวิทช์ PoE - Turkish: - PoE anahtarı - Vietnamese: - Chuyển đổi PoE.